Namco Bandai, Sega and Capcom have decided to make a 3DS game together, and we've finally got details explaining just how this thing will shake out. Appropriately dubbed Project X Zone, the game will be a roleplaying epic that cherry picks the most notable characters from each of the three companies involved. If that sounds like pure fan service, yeah, that's pretty much exactly what it is, but given the awesome cast the game has lined up, it's still quite impressive. Notice the quotation marks I put around the word "full?" 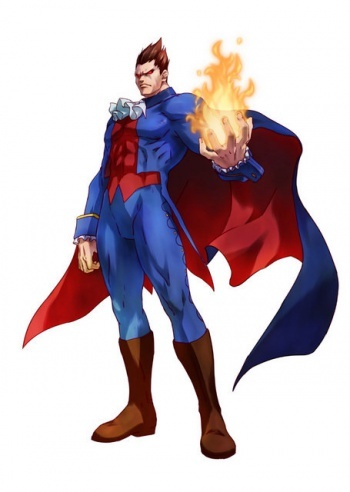 That's because the image of said characters Andriasang lifted from Famitsu and posted directly below that roster also includes Batsu Ichimonji from Capcom's Rival Schools. Why is he not included on Andriasang's list? No idea, but this does indicate that there may be even more awesome characters included in the game. As for when this thing might hit shelves, that remains a mystery. The trio of companies has promised a Japanese trailer sometime later this month, but so far there is no word on whether or not Project X Zone will ever see a Western release. Sadly, if history is any indication, it's likely to remain in the Land of the Rising Sun. On that note, I also recommend you have a look at Andriasang's huge screenshot gallery for the game. Y'know, so that you can be aware of exactly what you're missing out on.